THANK YOU for purchasing your new CalMark Cover!! PLEASE inspect your cover immediately and notify CalMark of any component defects, fitting issues or manufacturing defects. Please call: (805) 486-3863. In the event you do experience a tear, it is advised that it be repaired immediately to eliminate further damage. Your cover includes one repair patch kit. Additional Repair kits can be obtained by calling (805) 486-3863. Covers are not made to fit like a glove. All covers have wiggle room / allowances for easy installation and removal. All covers are made with extra fabric below the bottom edge of your RV, for the purpose of securing your cover UNDER your RV. This is two fold… one, the grommets are not touching your paint and it prevents the wind from blowing up the cover like a balloon. It is very important to make sure all sharp items on your RV are padded. Examples: ends of awnings (if sharp) tops of older AC units, corners of solar panels, windshield wipers, rain spouts / window rain gutters (on some retro models), ends of exhaust pipes, sides and top of ladder, edge of door step, etc, etc… every model has different needs. Tennis balls, sponge/foam balls, plumbing insulation foam, pool noodles, etc. 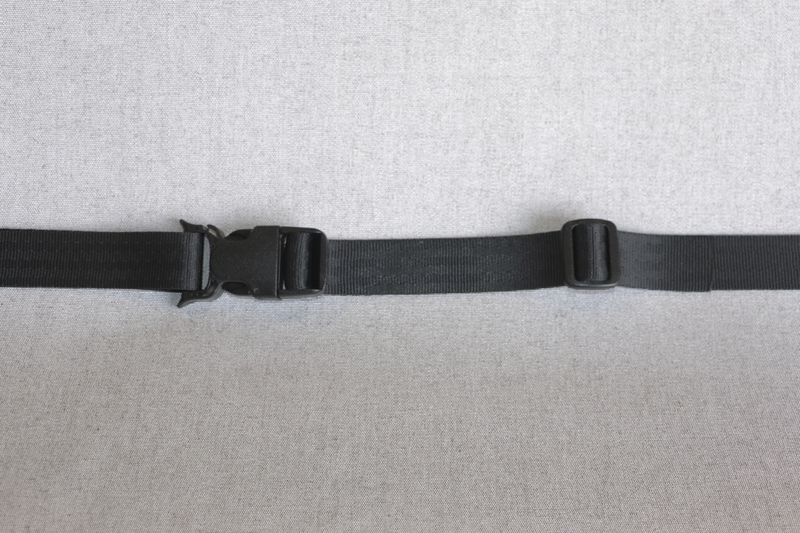 Zip ties are helpful in securing many of these padding items in place. Many will hold their location with the weight of the cover against them. For more detailed installation tips & padding – AND customer suggested methods of putting on your new CalMark Cover, please feel free to call or email us. We have lots of tips to share. Don’t settle for second best. 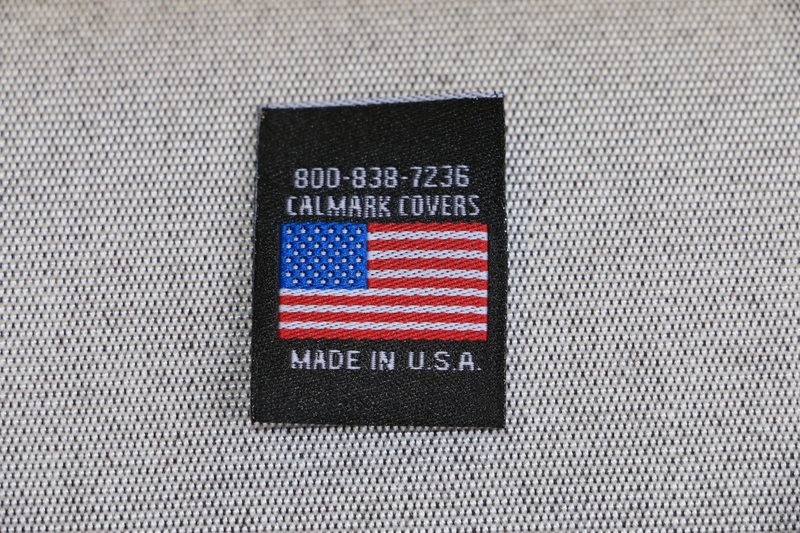 CalMark Cover Co. takes even greater pride in offering a 100% USA made product. 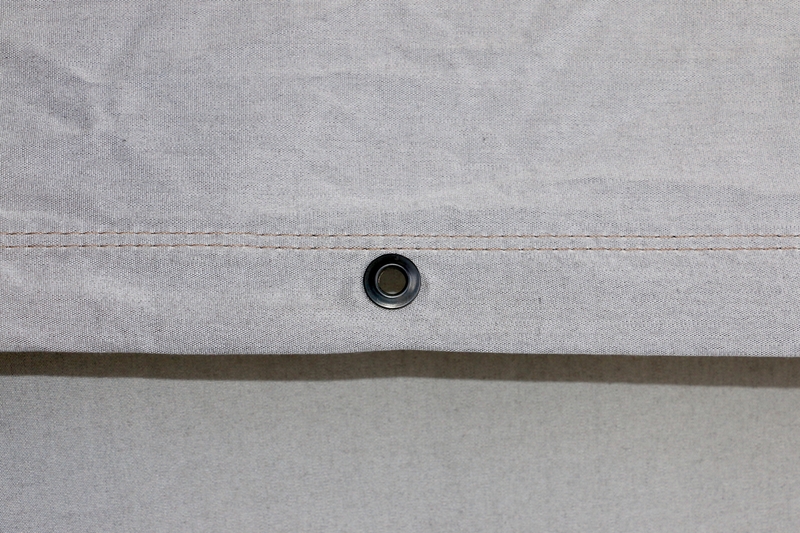 CalMark Cover Co. offers only Sunbrella® fabrics and hand makes each cover in their California factory. 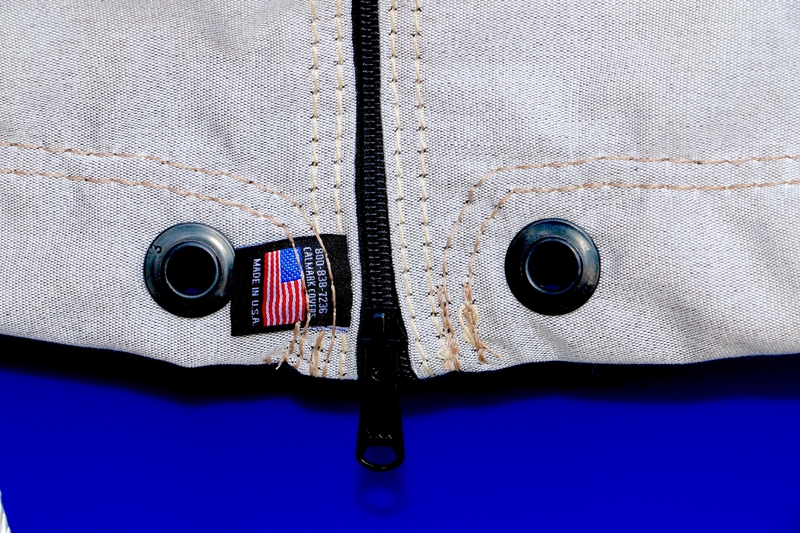 100% USA labor, 100% USA Fabrics, and 100% GUARANTEED! Use Caution when climbing up your ladder to install your cover and when walking on the roof (if you have an RV roof that can be walked on.) Check with your manufacturer as many RV / Trailers roof tops should not be walked on. Do Not put your cover on during a windy day. !! DO NOT Stand on cover when on top of your RV. You may slip or fall if the cover moves. Do Not walk on the roof with the cover on your RV as you may trip on vents, exhaust pipes, antennas or step through a skylight or solar panel. DO NOT attempt to sleep in your RV with the cover installed. Lack of sufficient oxygen can be detrimental to your health and may result in death. DO NOT allow fabric to touch exhaust pipe when hot. BE CAREFUL when installing your cover, if walking backwards, not step on vents, or back up and trip or fall. All fabrics exposed to outdoor use should be cleaned periodically before substances such as dirt, roof particles, tree sap etc., are allowed to accumulate on the cover and become embedded in the fabric. 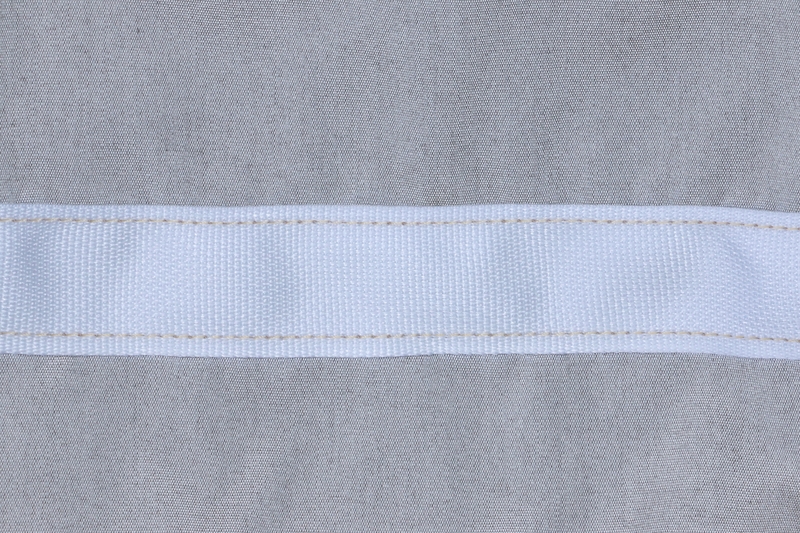 The fabric can be cleaned without being removed from the RV. Simply hose down and clean with a mild natural soap, (if needed), in lukewarm water. Rinse thoroughly to remove soap and let air dry. Wash your cover in the late afternoon to avoid intense baking from the sun. DO NOT USE DETERGENT. Wet the soiled fabric area with water using a small amount of mild non-detergent soap. Using a soft sponge/soft brush to work the soap into lather on the soiled or stained area. Rinse thoroughly with large amounts of water and allow it to air dry. It is important that all soap residues are removed. It is extremely important that when you store your RV cover, make sure it is completely dry. If wet, allow to air dry and store in a dry, well-ventilated area. Storing when wet (not normal use) will cause mildew/rot and is not covered under your warranty. If you need assistance or have questions PLEASE call or email. Our Helpful and Friendly Sales / Customer Service girls: Amy or DeAnna will be happy to assist you ! 303 CLEANER. If water has the potential to rain on your parade, 303® Fabric Guard, recommended by leading outdoor fabric manufacturer, Sunbrella®, restores water repellency to factory new levels. Multi-Surface Cleaner will aid in cleaning up any spilled food, drinks, or pesky dirt on a variety of surfaces and 303® Protectant will keep your surfaces looking newer and lasting longer. Your furniture and patio will be ready to impress! or call 1 (800) 367-3245 to find a retailer in your area.